Whilst we have focused mainly on the development of summer climbing equipment, it was more likely that winter equipment was designed prior to this, as rock climbing itself is just a mere evolutionary branch of mountaineering, which started its development in the Alps. Whilst we know that the first ascent of Mont Blanc in 1786 was made with little more technology than a normal wood axe or ‘ice hackett’ and a simple wooden stick with a metal spike at the end call an alpen stock. The state of the technology seem to stall there for some time. The Alpen Stock for instance was described as ‘more a moral support than a physical one’ by one mountaineer of the time. Yet they stayed the defacto piece of a mountaineer’s toolkit till well into the 1850s. Indeed Alfred Wills Wandering in the High Alps suggests that they were still widely used in 1853. In fact this Alfred’s book charts the development of many new pieces of mountaineering equipment. It is a vitally important piece of literature for our history as it fostered in the era of the Golden Age of Alpine Climbing. Wandering… was in essence the spark that set the flame for the upper class of Great Britian to embrace climbing as a pastime. He also uses the term Crampon in its original connotation. In that they were devices used by locals when working on the very steep grassy alps to prevent them slipping. Rather than the image you see today, instead think of a flat plate of metal the shape of the sole of the foot with a series of nails protruding out of the base. Mountaineers would later refer to these as ‘climbing irons’ with up to ten points, but later Wills would dismiss them as “hardly safe things to wear”. 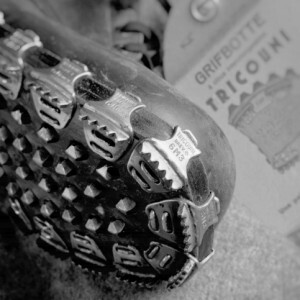 This is perhaps backed up by the fact that a selection of different nails were designed specifically for climbers boots. One of the reasons for their popularity was boots and shoes at the time were entirely leather, including the sole. As such the nails gave the boots of the era some form of grip. From quite early on there was advice on how to best attach them to your boots, including dampening the hole so the nail would rush into place. Whilst those ice screws Alfred use quickly went out of fashion, as they reportedly ruined the shoe. One nail invented by Felix Genecand went onto become so synonymous with climbing that the word made it in to the English dictionary in 1925. Felix went by the alias of ‘Tricouni’, and became the eventually leader of the nail pack in 1896 when he designed better fixing system for the nails on the edge of the boots, meaning they were very secure. The nails systems advantage over crampons was great, as not only were the boots lighter than with two great lumps of iron strapped to your feet, but with the advent of the Tricouni nail were much more secure. Alfred also sheds light on how we moved from the ice hatchet and Alpenstock to what we might generally consider the startings of an ice axe. When in his description on what he thought was the first ascent of the Wetterhorn, an ascent that was a key catalyst in the ushering in the golden years, he past comment on a new design of alpenstock. “The sticks the Oberland men carried were admirably suited to there work. They were stout pieces of undressed wood, with bark and knots still upon them, about four feet long, shod with a strong iron point at one end, and fixed at the other into a heavy iron head, about four inches long each way; one arm being a sharp spike, with which to hew out the ice where needed, the other wrought into a flat blade with a broad point, something like a glassier’s knife…. This kind of alpenstock is hardly ever seen in Chamouni… and the great utility of the of the Oberland implement called forth repeated expressions of admiration from the Chamouni men, to whom it was new”. Whether or not it was Alfred’s book that sparked the surge in mountaineering, as it was an early mountaineers guide to the Alps and in places full of evangelical joy for the hills, or it was the birth of these new technologies that were going to make alpine travel easier and safer, it is impossible to say. Maybe it is a bit of both. Although his book came at the end of the Romantic movement which celebrated the raw emotions of the shock and awe of nature and perhaps it was his words on experiencing the final moves on the Wetterhorn as he passed through a cornice and onto the summit ridge that helped inspire people to follow him. “The Instance before, I had been face to face with a blank wall of ice. One step, and the eye took in a boundless expanse of crag and glacier, peak and precipice, mountain and valley, lake and plain. The whole world seemed to be at my feet. The next moment, I was most appalled by the awefulness of our position. The side we had come up was steep; but it was a gentle slope, compared with that which now fell away where I stood. A few yards of glittering ice at our feet, and then nothing between us and the green slopes of Grindwlwald, nine thousand feet beneath. I am not ashamed to own that I experienced, as this sublime and wonderful prospect burst upon my view a profound and almost irrepressible emotion – an emotion which, if I may judge by the low ejaculations of surprise, followed by a long pause of breathless silence, as each in turn stepped into the opening, was felt by other as well as myself. Balmat told me repeatedly, afterwards it was the most awful and startling moment he had known in the coruse of his long mountain experience”. Whatever the reason, people followed him in great numbers and the next 10 years after its publication saw a flurry of first ascents across the alps, it would however take a long time for these early snow and ice climbing technologies to become further refined. The Evolution of Climbing Gear #7 – The Karabiner Story Cont.